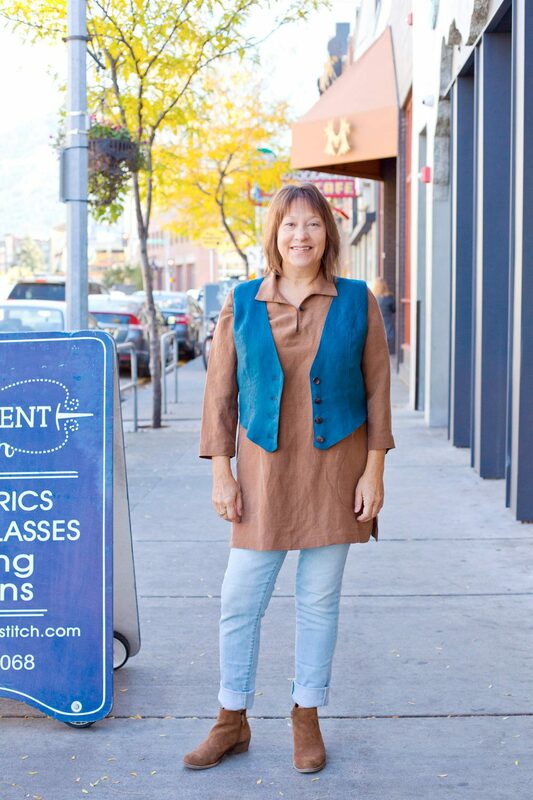 Although Bonnie loved both the pattern and the fabric, the result was a little monk-like, so she added a Jalie Vest! 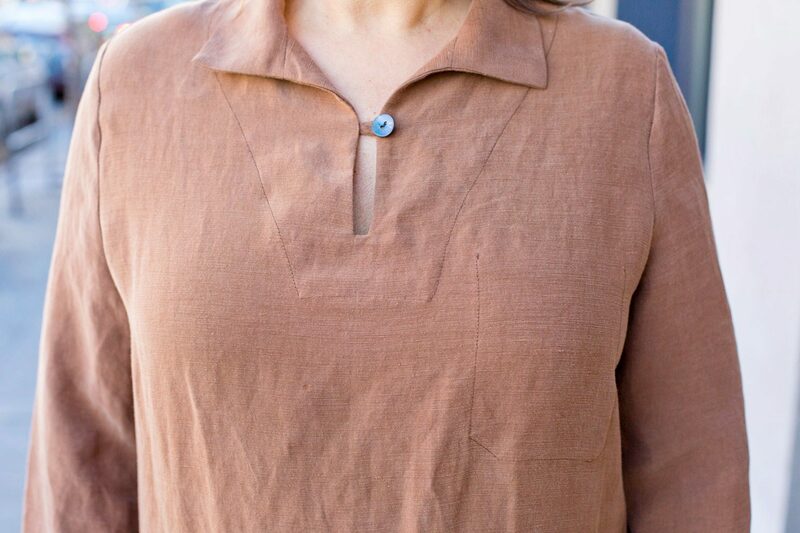 The Confident Stitch seamstress, Bonnie, made a Merchant and Mills Francine Tunic out of our newest eco fabric, called Cupro. She used the Whiskey color, but we also have Henna and Ecru. M & M describes the Francine as a slim-fitting A-line dress/tunic with side seam pockets, an inside breast pocket, and optional side slits. AND, all three colors of Cupro and the Francine Tunic Pattern will all be 15% off for the next week (until November 2)! What the Heck is Cupro? We are in love with Cupro. What is Cupro? It is a fiber derived from cotton linter, the ultrafine, silky fibers that stick to the seeds of the cotton plan after ginning. The fabric breathes and regulates body temperature like cotton, drapes like silk, has a shiny side and a matte side, is hypoallergenic, and antistatic! PLUS, it’s machine washable and dryable. Did I mention we love it? Our Cupro is a blend of Tencel (30%), Linen (35%), and Cupro (35%). Bonnie found the instructions for the Merchant and Mills Francine Tunic easy to follow, and she didn’t make any changes to the pattern. She did interface the front and back facings because the Cupro is drapier than the denim suggested for the pattern. She had some quibbles with the fit of the tunic, however: She thought the upper chest and upper sleeve were too tight, which she felt was exacerbated by having the armscye seam allowance pressed toward the main body and then topstitched. Also, she inserted on the flat, before the side seams were sewn, and Bonnie thought there would be more room in the upper sleeve if it were inserted in the traditional way (eased in after the side seams are sewn). While she loves her Cupro Francine, she will consider a fabric with some stretch for her next version. Merchant and Mills pattern envelopes are confusing for Americans because they use metric measurements and British sizing. Bonnie made the Francine in size 12, which is her American size. Her British size is closer to a 14 or a 16. I think if she makes a larger size, the armscye and upper sleeve issues will be alleviated. And Save 15% Until Nov. 2! This entry was posted in Pattern Reviews, Tops and tagged Cupro, Francine, Merchant and Mills, Tunic.